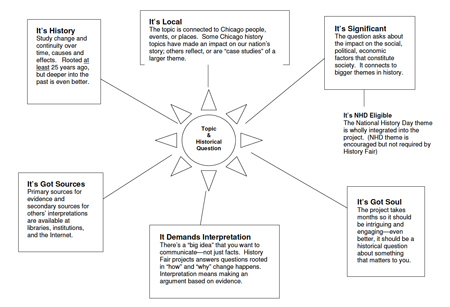 The graphic above from the Chicago Metro History Fair (formerly Chicago Metro History Education Center or CMHEC) is a great encapsulation of how to choose a topic for a history fair project. In addition, ask yourself the questions listed below. Does the topic relate to the 2017 National History Day (NHD) theme: Taking a Stand in History? For Illinois students, does the topic relate to local or Illinois state history? Does the topic really interest you? Will you be able to find enough primary and secondary sources to thoroughly research the topic? What will people learn from your project? 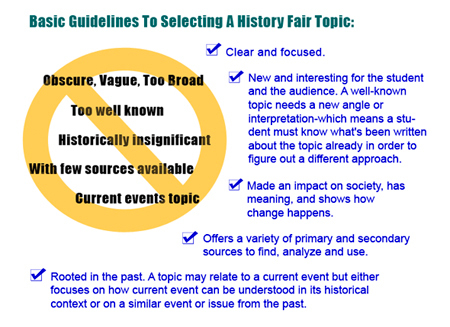 Below we dig a bit deeper and uncover some strategies from TPS-Barat and Chicago Metro History Fair (CMHF) for selecting a topic for your history fair project. Each year NHD chooses a particular theme that must be the focus of student projects. For 2017, the theme is Taking a Stand in History. Before doing anything else, make sure you understand the theme. Read the theme book National History Day 2017 Theme: Taking a Stand in History. A few more suggestions adapted from suggestions from a NHD coordinator from an article found on the CMHF website are listed below. Discuss how the theme of Taking a Stand relates to people, events, and issues you’ve learned about earlier this year and in previous years and make a list. Free write about what the theme means to you personally or to someone you know. Create an outline or mind map of the topic ideas listed in the articles above. Review the CMHF suggested topic ideas and sample topic Library resource lists compiled by TPS-Barat, which consist of primary sources & other resources primarily from the Library of Congress. Browse through a history textbook. Check out local and state historical sites, museums and websites. Consider refining your topic using the following steps: theme, interest, broad topic, narrow topic, thesis. Try filling out one of these topic selection worksheets from NHD and CMHF. Review the excellent graphic organizer from CMHEC highlighted below. Download the graphic organizer (includes a blank copy).